After studying at Capernwray Hall in England and dramatically having His life changed by God, Hideki (Tana) Tanazawa had a dream to start a Torchbearers Bible School and Retreat Center in Japan. In 1987, his dream became a reality and the center opened its doors. 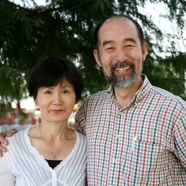 Tana and his wife Sachiko have served faithfully for over 25 years. You will recognize Tana by his joy-filled smile and Sachiko by her wonderful laugh (you’ll know that she’s close by when you smell wonderful food!). Tana’s joy is serving the church by teaching God’s Word. They have worked hard for many many years and are now looking forward to transitioning into a retirement full of serving the Lord.